Do you have or suspect mould growth in your home or workplace? Hire a professional mold inspection company like Indoor Air Quality Ottawa. Through the use of state of the art mould detection tools – we help you make the most informed decision. Our inspectors will then provide recommendations on how best to deal with the removal of the toxic mold once and for all. Our motto is: we only sell good advice. Ensure that your environment is safe for your family and co-workers. Keep it dry. Keep it clean. Keep it ventilated. Keep it healthy! IAQ Ottawa has performed over 3000 indoor air quality inspections and improved air quality in some of Canada’s most harsh environments, including Canada’s Arctic. We have tested schools, daycares, hospitals, staff housing, dentist’s offices, multi-family complexes, airports, indoor garages, and office buildings in many Canadian communities. Our solutions and project management reflects on our style, building science knowledge and extensive experience. IAQ Ottawa’s inspectors and indoor environmental consultants are CMHC trained and certified. Every inspector is equipped to test for all hazards found in a building’s air quality. Our inspectors are also certified building ventilation designers. We can determine duct airflow and test building pressure differentials. Our professionally trained inspectors have over 13 years experience inspecting all aspects of commercial air quality. They will determine the cause of your mold or air quality problems. Our certified inspector must first identify and address the building-related conditions that caused your air quality hazard prior to recommending a permanent solution. If not, the problem will simply return. Are you introducing too many chemicals into the office? Does your building contain hazardous building materials? Does the ventilation perform optimally? Our newer airtight buildings create problems for volatile organic compounds (VOCs) that off-gas chemicals into the building interior. Renovations can expose hazardous compounds like asbestos. Our certified inspectors are trained and equipped to measure all types of exposures, not just mould. doesn’t come in a can! Are you adding volatile organic compounds to your home? Is something growing in your basement that is contributing to poor air quality? Learn how to identify conditions that affect air quality now and in the future. IAQ Ottawa’s investigations begin with an occupant survey focusing on air quality related questions in your home or office. Following the survey, our technicians will perform a visual assessment of the building and determine what sampling or investigative techniques are required to diagnose and identify your air quality problem. Electro-chemical sensors, particle counters, or air collecting pumps will be calibrated and used to take samples. The type of sampling we do will be determined during our investigation. You will receive an emailed, written report of the laboratory sampling results. Our motivation is to improve your indoor air quality – period. We are not motivated to sell duct cleaning, mold remediation, or asbestos clean-up. It is not professional or industry good practice for an inspector to diagnose, clean, and clearance test their own work. Once Indoor Air Quality Ottawa identifies the source of your air quality problems, our inspectors will recommend professionally certified and insured experts for all your mould remediation needs as well as independent, 3rd party clearance testing following all indoor environmental work. An Air Quality consultant must have vast building construction and building science knowledge. 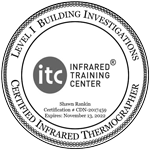 The inspector must be certified with ventilation design (HRAI) Mechanical systems and building codes. IAQ Ottawa has performed over 3000 inspections and over 20 years of building science experience since 2003 of experience testing, backed by the accreditation required to cover all types of indoor air quality issues… not just mold! Air quality falls into two distinct categories; biological and chemical. An experienced consultant must recognized building conditions that generate bacteria, fungal or chemical off gassing. An action plan must be directed at solving the building condition that precipitated the air quality concern first. Only then does the remediation plan address the contamination followed by 3rd party clearance testing to ensure a safe and healthy occupancy. Planning a new build or renovation? Meet with an experienced building science professional first. Get a 3rd party’s opinion and advice on your construction project from someone other than your contractor. 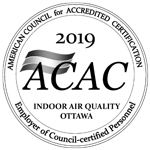 We will visit your site, review your drawings, and make recommendations on products, materials, and installs. Why suffer alone? There is a solution! Allergies are a hypersensitive immune system response to aerosolized particulate or substances such as pollen, dust, dander, mold, or dust mites. A typical seasonal allergy is triggered by exposure to an RSP (Respirable Suspended Particulate), or commonly referred to as airborne allergens. Environmental conditions vary with season, humidity, exposure time, and concentration. Outdoor allergens enter our living spaces, or become concentrated indoors through occupant activity or environmental conditions found in our home or office. Airborne allergen reactions require the aerosolized trigger to be present in the occupied environment. Effective allergy treatment first response is to remove the affected person from the environment. This becomes difficult when the response is triggered in our own homes. Airborne allergen reactions are caused by amplification of identified indoor particulate in the living space. These particles are typically very small and can be aerosolized by occupant activity, mechanical system, vibration, seasonal pollen and seeding, or dampness. The good news is that most aerosolized allergens have mass, and are affected by gravity. If allergen size can be measured, it can be counted to establish exposure and cleaning effectiveness. Ultrafine particle counting is a means of determining all sizes (up to .03 microns) of aerosolized particles in our homes. If we can measure it, we can remove it. Modern air quality laser particle counters or total dust monitoring devices can accurately determine what exposure level you inhabit. Once particle size and quantity is established, effective air scrubbing, ventilation, or HEPA filtration strategies can be incorporated into your daily routine to reduce your allergen concentration and personal exposure. Don’t just treat the symptom, reduce the trigger! Modern environmental cleaning methodologies can be used to greatly improve the air you breathe. Is your home ready for your baby? Health Canada identifies three groups that are most susceptible to indoor air quality contaminants – seniors, pregnant mothers, and newborns. Our indoor environment may contain biological or chemical air quality concerns that have not yet been identified by the building occupant. Renovating for the new baby may aerosolize mould, asbestos, or lead particulates into the indoor environment. Construction dust, paint odours, glues, and compounds affect our air quality. Ultra-fine particulates accumulate in our homes overtime, typically aerosolized by common occupant activity. Have your home inspected by a certified, experienced, air quality technician. A typical inspection will identify air quality concerns and will provide the homeowner with effective strategies for remediation, abatement, or cleaning.